With October only just beginning some might say it is a little early for the dead to be walking, but I say it is never too early to get into the spirit. We’ve gotten great participation this week too! Combat Armor Mecha – this is a Robotech style mini project. Tablewar – This is a an interesting transport/display case. Scout Ship – This is a rare vehicle project on Kickstarter. I like the style though it it is not immediately useful for wargamming. First up we have my contribution for the week. I feel like I’m starting to put those long months without painting behind me. I like how this color scheme turned out, though this project made me wish I had a brown ink. 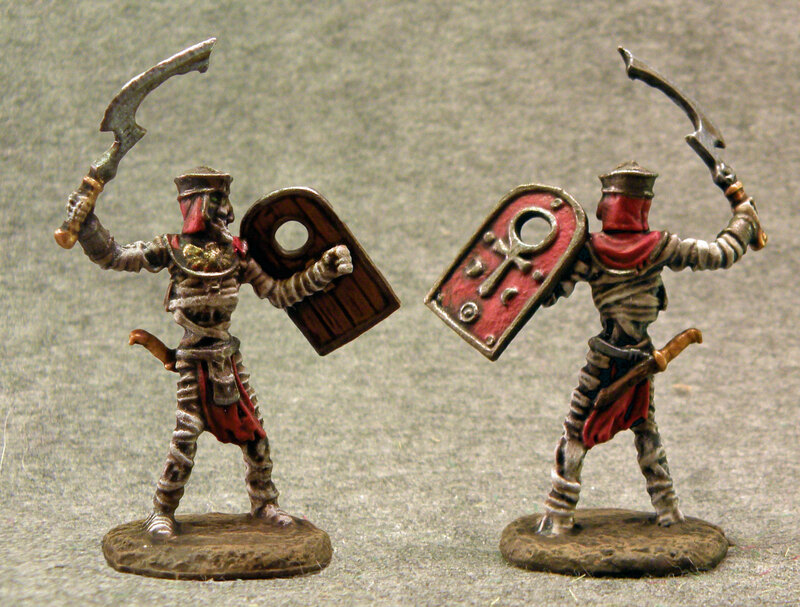 Unfortunately the wash really obliterated the layers of subtle drybrushing I tried to use on the bandages. 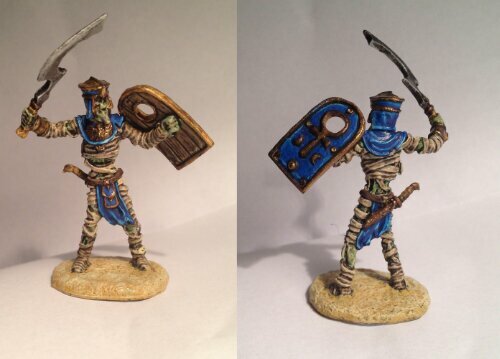 Next we have a mummy done by Niels. Aside from the choice of Tan, he made very similar choices. 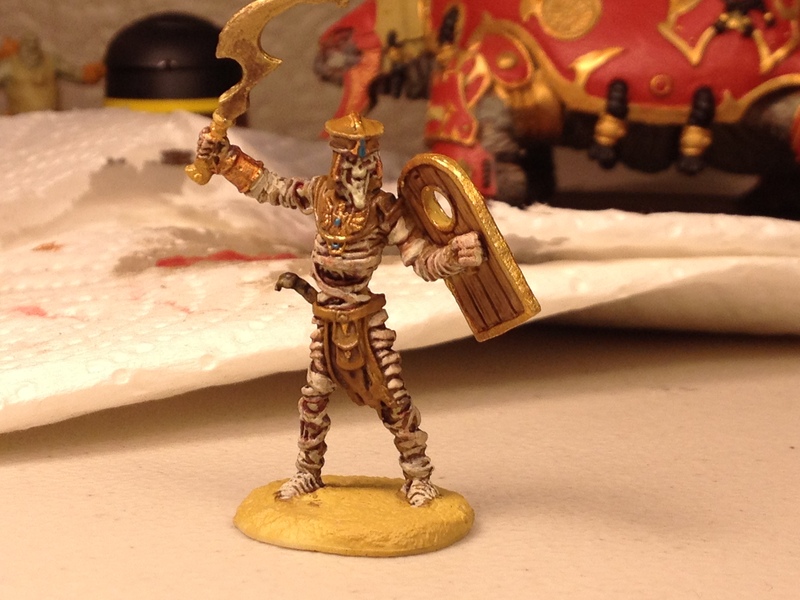 Magnus’s color scheme is just short of ostentatious. The rich tans blend with the gold to create the sense that this mummy was a very wealthy man in life. Clint’s Mummy is next. We both went for teal. Without discussing it. How’s that work? Jessica’s entry is excellent, as we have come to expect from her. 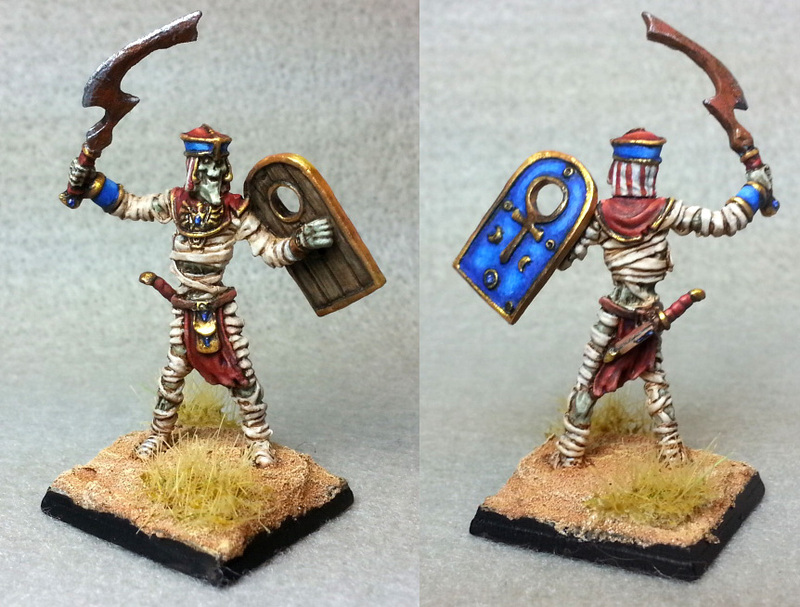 Tonya, who joins us from the Reaper forums, sent in this terrific mummy. I love the contrast between the muted bandages and the bright shield. The striped head drape is a great touch. 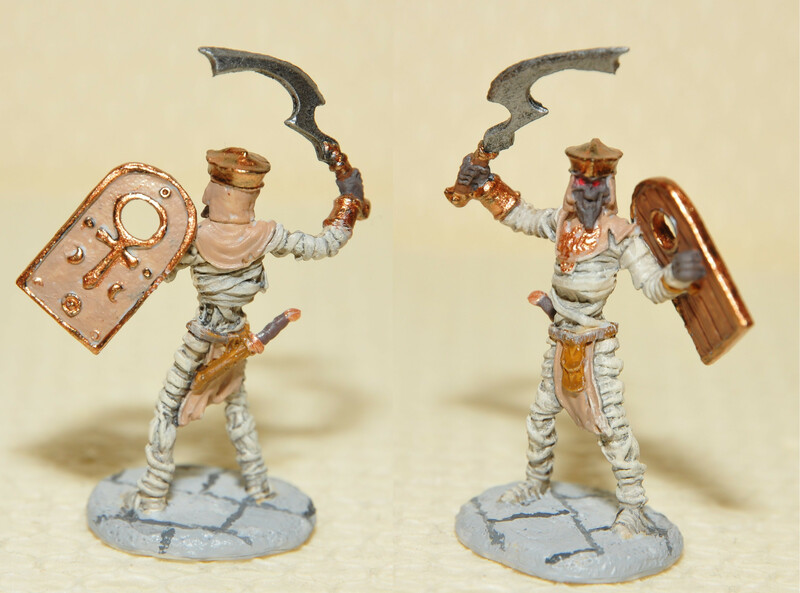 David, a newcomer to our painting challenge did a wonderful job. 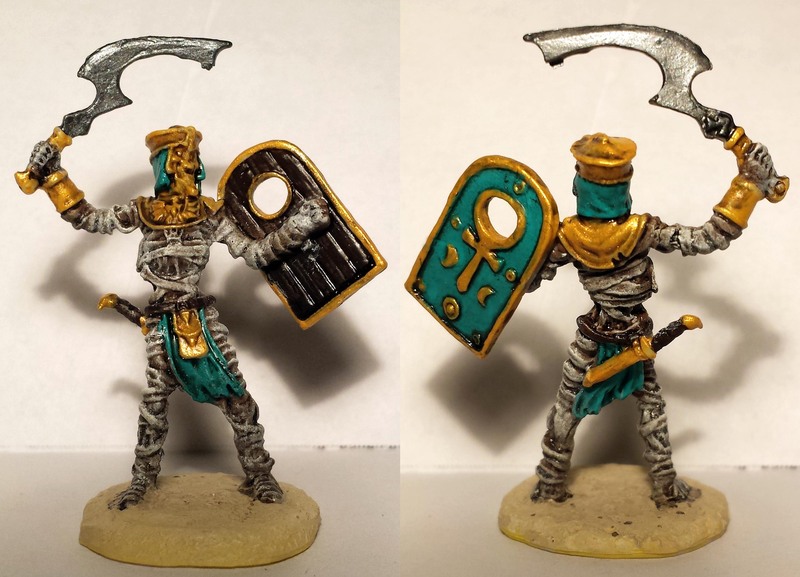 Notice the rotting flesh and highlights on the cloth. 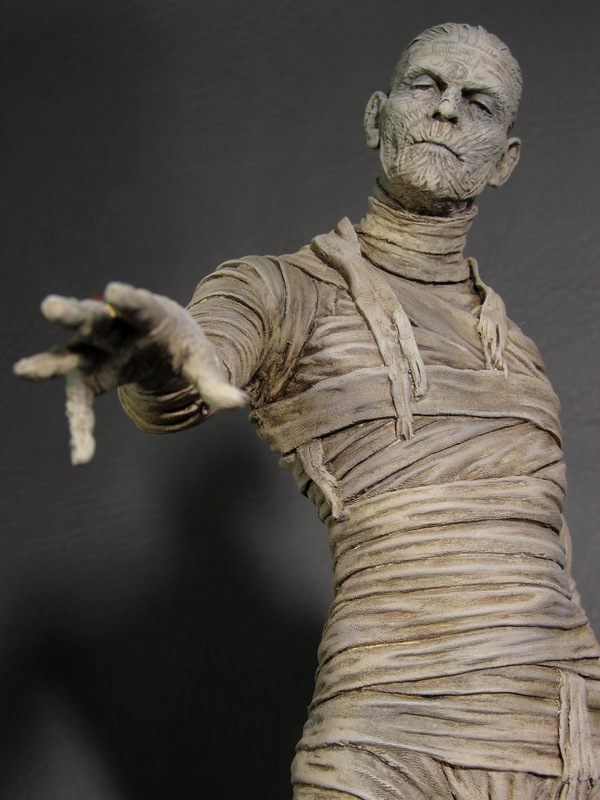 Jeff did a great job on his mummy as well; the face is particularly well done. Big thanks to everyone who sent in a picture this week, this is the largest turn out we’ve had for a Miniature Monday and they all look amazing! Next week’s challenge is the Well of Chaos, I hope everyone sends in a pics for that one as well. Wooooof, the competition is getting fierce! Jeff gets my nod for Most Improved, but I think Tonya is taking home the gold this week. Brava! Yes, Tonya’s Mummy looks really great. Hey Niels, welcome to the madness. 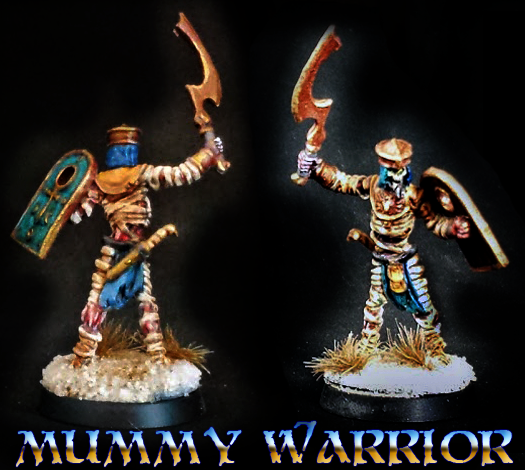 Good job on your mummy warrior, the flagstone effect had me fooled. Everyone did a great job! It’s awesome to see so many people submitting pictures. Thanks for the compliments! It’s really cool to see all of the different interpretations of the same model. Nice job, everyone! I absolutely agree! It really inspires you, because you have thought about the model before you started, and you realize after how it also could have been done! 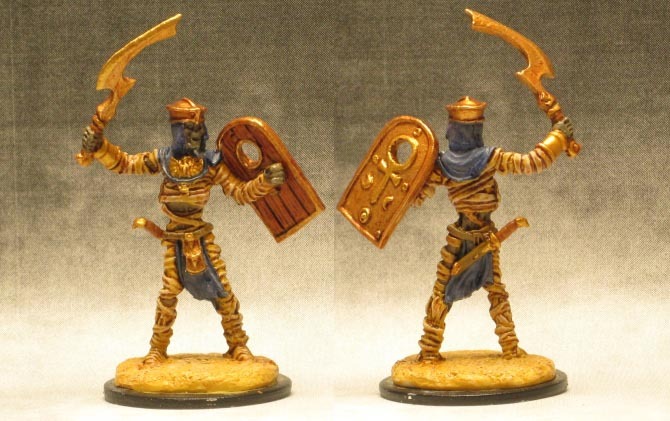 Even though I’ve painted many years, I still think this is a very good way to learn!